Spread the holiday cheer by cooking for everyone near! We at KptnCook want to help you be merry with the help of these delicious recipes. We have put together four very different, but equally tasty holiday recipes. Each recipe can stand alone, but they also come together to make a three course meal, beverage included. Tis the season to be jolly after all! Hope you enjoy! Pear and Walnut Salad by eat this! Halve, break into pieces, and de-seed pomegranate. Coarsely cut walnuts and toast in a pan without oil for 2-3 min. Thoroughly wash orange and grate zest. To fillet orange, cut off top and bottom of orange. Then slice the peel off into strips from top to bottom, in a curved motion following the shape of the orange, make sure to remove all the white bits. Cut out the individual slices of the orange along their thin skin. While filleting the orange, hold it over a bowl to collect all the juices. Finally, squeeze out juice form the rest of orange. To make vinaigrette, mix dijon mustard, white wine vinegar, orange juice, zest, and agave syrup. Season with salt and pepper. 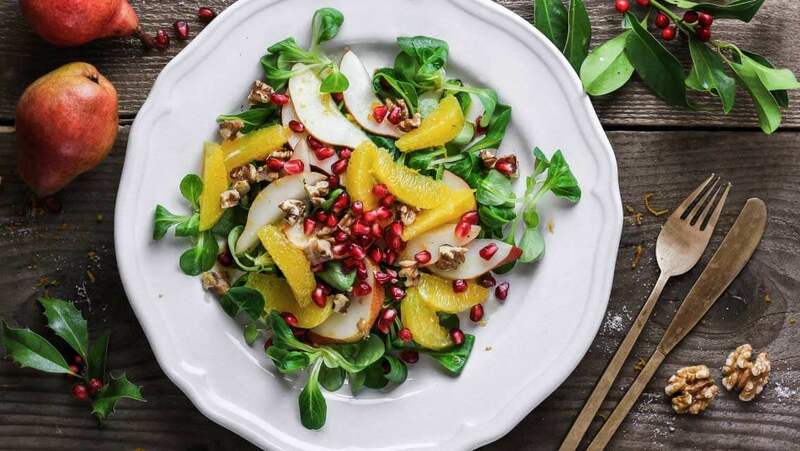 Arrange salad on a plate, top with pear, orange, pomegranate seeds, and walnuts. Drizzle with vinaigrette and serve. Peel and finely dice shallot. Peel and finely dice ginger. Wash lemon, grate zest, and squeeze out juice. Pestle spices or mix the grated ones. Heat some oil in a pan and sauté shallots for 2-3 min. Add apple vinegar, sugar, ginger, and lemon zest; then bring to a simmer. Add persimmon, season with season mix, and let simmer for about 15 min. Season lamb chops with salt and pepper, sprinkle with lemon juice, and set aside. Wash, peel, and dice potatoes. Boil in salted water for about 5 min. Drain potatoes and fry with olive oil and rosemary for about 8 min. Heat oil in a separate pan and fry lamb chops per side for about 2 min. 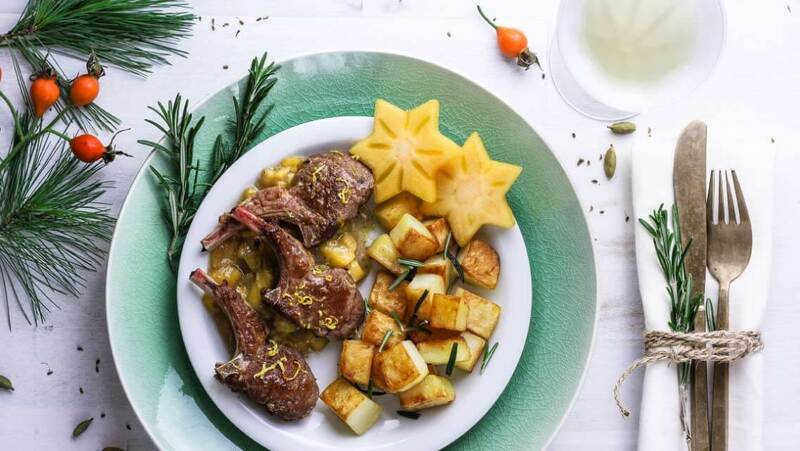 Serve lamb chops with persimmon chutney and rosemary potatoes. To make the dough, knead diced butter, egg, and sugar together. Add a pinch of salt and cinnamon. Strain flour and cacao over the butter, mix and knead until smooth. If time allows, put the dough in a fridge for 30 min. Roll out the dough about 1/5″ thick and cut out cookies. Place cookies on baking sheet layered with parchment paper and bake for 10-12 min. 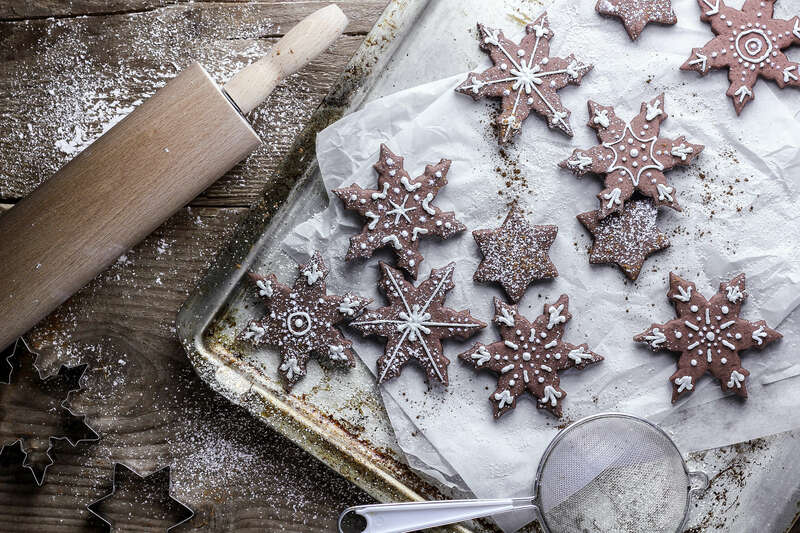 Decorate cookies as desired or dust with powdered sugar. Enjoy! Wash lemon, cut off the skin with a vegetable peeler, then cut into thin strips. Halve lemon and squeeze out juice. Cut open vanilla bean and scrape out seeds. Add pear juice, vanilla pulp, lemon peel and juice, cloves, cardamom, star anice, and honey to a pot. Bring to a boil and let simmer for 8 min. Remove from stove and add rum. Wash and slice pear. Cut out core. Pour punch into glasses through a sieve. 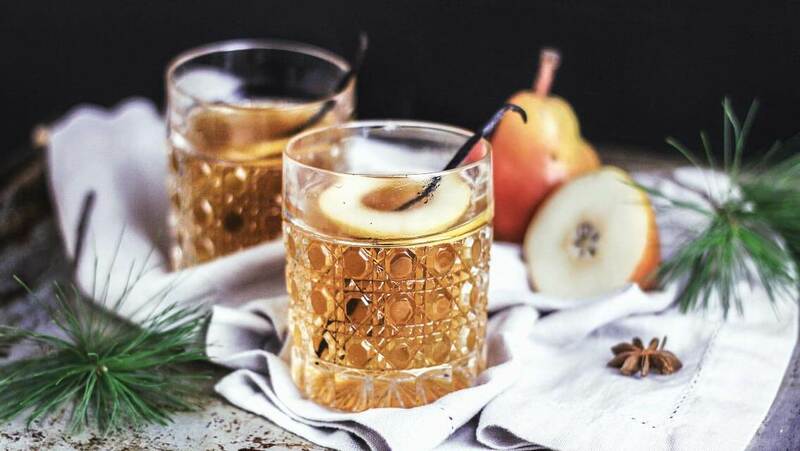 Decorate the drink with pear slices and scraped vanilla beans to serve. Hope this helps fill your holiday season with good food and cheer. If you have any other holiday recipes please comment below, we love having more delicious food to celebrate with. If you want additional KptnCook recipes, find more in the free KptnCook app. Posted in Rezepte and tagged christmas recipes, christmas salad, cookie recipe, holiday appetizers, holiday recipes, lam chop recipe. Bookmark the permalink. This a great post. Very good ideas 🙂 They all look so delicious.